The world is divided into two categories. Those who know how to correctly expose their photographs regardless of the scene they have in front of them... and those that don’t. If you belong to the first category, congratulations! You are a genius and there’s little I can do for you. But if you are like the rest of the mortals and want to learn how to easily expose your photographs in countless different situations, you’re in the right place! You’ll also master your camera in such a way that you’ll capture those images that you dream of, both from the point of view of the story you want to tell as well as the exposure. I’ll give you everything you need to succeed. Basic concepts (light, exposure triangle, reciprocity law, exposure modes, metering modes, and much more), tools such as PhotoPills that will help you with exposure calculations, a ton of practical examples, the mistakes you should avoid... And even the most advanced techniques such as the use of filters and bracketing. Welcome to the wonderful world of the exposure. Get the whole Exposure ebook for FREE now! As I did in the guide about depth of field (DoF) and before going to the point, let me give you some quick answers to the main questions regarding exposure. It’s the amount of light that reaches a photosensitive material (i.e. the film or your camera’s sensor) to create an image. Dominating the exposure will give you complete creative control over what appears illuminated and what doesn’t in your images, allowing you to tell the story the way you want to. Three variables affect exposure: aperture, shutter speed and sensitivity (or ISO). That’s what called the exposure triangle. Once you dominate these parameters, you’ll dominate exposure. The diaphragm aperture (hole through which light travels through the lens) regulates the amount of light that goes through your lens to the camera’s sensor. The greater the aperture of the diaphragm, the more light will be collected by the sensor. In addition to exposure, the aperture you use will also have an impact on depth of field. So you should choose its value not only thinking about the exposure, but also about the depth of field you want to get in the photo. The shutter is a sort of curtain that’s in your camera. It allows you to let light pass through the sensor for a certain period of time. That period of time when the shutter is open is the shutter speed. The slower the shutter speed the more light will be collected by the sensor. Sensitivity (or ISO) is a parameter that allows you to tell the sensor how much it has to amplify the signal it receives. The higher the ISO, the more the signal will be amplified and therefore the sensor will seem to have captured more light. The photo will be brighter. Therefore, when you read on the internet that "the higher the ISO the more light the sensor captures", it’s not referring to the amount of light it captures, but to the amplification of the signal from the light itself. Therefore, when the signal is amplified too much (high ISOs), noise appears in the photo. A stop is a relative measure of the amount of light reaching the sensor. Imagine that there is an amount x of light coming into the sensor. If 2x amount of light reaches the sensor when you take the next photo, you’ve increased the exposure by 1 stop. On the contrary, if half of the light (x/2) reaches the sensor, the exposure of your photo has decreased by 1 stop. By changing the exposure triangle parameters, the light reaching the sensor will vary in a given number (or fractions) of stops. The exposure value (EV) is a combination of aperture (f number), shutter speed and ISO. It indicates how much light reaches the sensor. The dynamic range is measured in stops or in exposure values (EV). It establishes the relationship of the existing light intensity between the darkest shadows and the brightest highlights. Therefore, a camera with a large dynamic range is capable of capturing simultaneously (in the same frame) the detail in some very dark areas of the scene and in others that are brighter. The histogram is a statistical graph. It’s very useful because it gives you information about the range of tones or levels of brightness (how dark or bright a color is) present in your image. With the help of the histogram you can know if the photo is "correctly" exposed or not. It’s a setting, measured in stops or in exposure values (EV), that brightens or darkens the picture depending on whether you do it positively or negatively. If you use positive values you brighten the image (you overexpose it). Conversely, if you use negative values you darken it (you underexpose it). It depends! Establishing a "correct" exposure is totally subjective. A photograph may have a correct exposure for you but not according to another photographer. The important thing is that you consider you’ve achieved a correct exposure if you get the effect you want to convey or the result you have in mind. Depth of field (DoF) is the distance between the closest and farthest element of a scene that appears "acceptably sharp" on the image. If you want to read more about it, take a look at the definitive depth of field guide. It’s a technique that consists in leaving the shutter open for a relatively long period of time. By doing this you get amazing results like car light trails, ghostly people or a photo of the coast with the silky water effect. In section 22 you will discover how to take long exposure photos with the help of filters. You will also learn how to use the PhotoPills exposure calculator to determine the shutter speed you need when using a filter. Light is the soul of photography. Without light there is no photo. So if you want to make truly legendary pictures, you should master the light (both natural and artificial). Without knowing light properly, you can’t expose correctly, nor create the desired effect. Therefore, you’re not able to take that photo you’re looking for. Ultimately, learning the attributes of light (intensity, direction, quality and color), as well as the difference between incident and reflected light, gives you a solid base to take your equipment, expose and make the most of out of the different scenes that you’ll face. Sorry to all the physicists in the room! I’m trying to simplify as much as possible, so I dare say that light is the visible part of the electromagnetic radiation generated by a specific source of energy (the Sun, a flashlight, a LED bulb, a flash, a fire, etc.). It’s formed by elementary particles called photons. A photon is a particle without mass that carries all forms of electromagnetic radiation, including gamma rays, X-rays, ultraviolet light, visible light, infrared light, microwaves and even radio waves. But to make things easier, a photon is a tiny particle. Light is made of a whole bunch of them. That said, let's leave physics aside and talk about what really matters to us. Let me show you what the attributes of light are and how they affect you when you take photos. As I told you at the beginning of this section, light is the soul of photography, the raw material, the basic ingredient. Without it, it wouldn’t be possible to take pictures. It’s essential. This means that depending on how you use it, you get one result or another, expressing in different ways what you saw or happened. That’s why it’s fundamental to know its attributes, so you’re able to understand it and manage it the way you want. And I don’t refer only to natural light but also to any kind of artificial light. Direction: front, side, rear, zenith or nadir. Intensity is the amount of light that falls on (or falls upon) a subject. It determines how much the subject is illuminated. If the light is very intense, it brightens the subject too much and the shadows are very noticeable (very dark). On the other hand, if it’s not very intense (or dim), the subject is darker, less illuminated, but the shadows are less dark, less harsh. Depending on the intensity of light in the scene and the area(s) you want to highlight, you should decide your camera settings in one way or another when exposing your photos to allow the amount of light you want to reach the sensor. So knowing how to correctly measure the intensity (or quantity) of light in the scene plays a fundamental role when calculating the exposure. Especially if you want to get in your photos this "right" exposure you are looking for. And how do you measure, or meter, light? You measure it with a photometer, whether it’s internal (inside the camera) or external. In section 18 I will explain you in full detail how and where to meter light with your camera when exposing your pictures. Can you control light intensity? As a photographer, you can often affect the light intensity that you want to have in the scene you are photographing. For example, if you’re shooting outdoors, choose the time of day when the light is less intense (golden hour, blue hour and twilight) or more intense (rest of the day). Or use, both outdoors and in the studio, different techniques and lighting devices or light reducers. For example, flashes, flashlights and LED panels are active elements that produce light by themselves and are used to add brightness to the scene. In addition, passive elements (diffusers, filters, reflectors) alter the illumination although they are not light producers. Light direction determines many of the effects that you’ll capture with the camera (volume, textures, silhouettes, etc.). Therefore, you have to work with natural light and/or artificial light (light schemes) to achieve the effect you’re looking for in your photo. Remember that light direction is the angle with which light hits the subject. How does light shine on the subject from the position in which I am (i.e. from your camera)? How do I want it to affect the subject (or scene) according to the type of photo I'm looking for? Frontal lightning. It’s located in front of the subject so it faces it. It illuminates all visible surfaces of the subject. It highlights the color but it eliminates shadows, subtracting volume and texture. Side lightning. It affects the subject from the side. Thanks to this light the spectator has a sensation of more volume and it increases the texture of the subject. For example, in night photography, when photographing the Milky Way or Star Trails, you can take advantage of the side light provided by a low Moon (when it has little elevation) to capture volume and texture in the foreground. Back lightning. It comes from behind the subject. It helps to highlight the subject's silhouette, but subtracts information from other elements such as color or texture. Back lightning allows you to make spectacular portraits with perfectly shaped subjects, landscape and even spectacular silhouettes of full Moon. Zenith lightning. It comes from a single point of light located vertically above the subject. When you control it shooting in the studio, you can create incredibly mysterious pictures. Nadir lightning. It comes from below. It rarely occurs in natural conditions, although good examples are snow and water reflections. You can also use it to make risky portraits, such as the one you can see below. “This is your last chance. After this, there is no turning back. You take the Skull pill: the story ends, you wake up in your bed and believe whatever you want to believe. You take PhotoPills: you stay in Wonderland and I show you how deep the rabbit-hole goes. Remember: all I'm offering are Legendary Photos and Goosebumps, nothing more." Light direction rarely comes from exactly one side or the other. Most of the time it comes from a combination of several directions. An object isn’t usually illuminated by a single source of light but by several ones. Depending on the intensity (i.e. weighting) of each of them, the scene will be different. Obviously, the most intense light will be the main one. Light quality shows the distribution of lights and shadows in your scene. That is, the transition between the two. Hard. It comes from a very specific source and produces a marked and sudden transition from light to shadow. The shadows are very dark and contrasted with very well defined edges. For example, the light produced by the flash or the Sun at noon (in most of the world) is a hard light. There is hardly (pun intended… :)) a transition between lights and shadows. In this case, there is a lot of contrast. Hard light gives you a feeling of aggressiveness and strength. You can use it, for example, to create high contrast scenes with portraits or still lifes while separating dramatically the contrast from the scene. High contrast scenes are a challenge for any photographer. In section 22 I'll show you how to capture high contrast scenes with filters. And in section 23, I'll explain you how to do it using the bracketing technique. Soft. Unlike hard light, soft light causes a progressive transition between lights and shadows. It’s a very dim light and it blurs the outlines of the shadows. It smooths the image, removing contrasts and textures. Depending on the light quality you have in the scene you can take different types of pictures. If you’re skilled enough you can also use a tool to change light quality. For example, to soften a hard light use a diffuser or a reflector. And to add a hard light, use a flash or a flashlight. As for natural light, take advantage of the moments of soft light that occur during the day: the golden hour and the blue hour. You know what they say, if you can’t beat the enemy, join them! Throughout the net you’ll find tons of web pages that will tell you when these hours happen on an exact date. But if you are one of us (you use the PhotoPills app), you have all the information about the golden hour, the blue hour and the twilight, for any date and part of the world, both in the Sun tool and in the Planner. PhotoPills - Sun Pill Tool. The size of the light source relative to the illuminated subject is crucial to know what type of light you have. Thus, a source of light produces hard light over an object when this object (your subject) is larger than the light source. On the contrary, it produces soft light when the object (your subject) is smaller than the light source. Similarly, for a given size, the distance to which the subject's light source is located determines the light quality. I'll give you an example. The Sun is a huge source of light. However, when it’s far away from your subject, it becomes a point and it produces harsh shadows. When light strikes a body, there is a part that is reflected, another one that is transmitted through it and another one that is absorbed. The thing is you only see color when the reflected light reaches your eyes. And, as long as light doesn’t interact with matter and reaches your eyes, you don’t see it, you don’t see color. Think of deep space, you see it completely dark. However, it’s full of light. Actually, the way the scene colors are displayed in a picture depends on you and your artistic vision. And you might not always want the final image colors to be the same as those in the scene. Sometimes you may want to change them. When we lived in the days of film negatives and slides, or when you took pictures in black and white and wanted to change the light color, you had no choice but to use color filters. Although I am a lover of analog photography, I must admit that in the digital world, apart from the color filters, we have another very powerful tool: the white balance. In my opinion, the white balance is a tool that we photographers have to show our artistic side in terms of how colors look in our photos. I'm not going to go too far on this concept, but I would like you to keep in mind that you can adjust the white balance directly on camera or later on with an editing software. This tool allows you to add a warm or cool cast to your photos. It’s important to know the difference between incident and reflected light, especially when you take pictures in a studio. It helps you understand where you need to meter light in order to calculate the exposure. On the one hand, incident light is the light that the subject you’re going to photograph receives. You can meter it with your camera’s light meter or a hand-held photometer by placing it next to the subject and point it towards the camera. The photometer gives you exact exposure values because it’s not affected by the reflectance of the objects you’re capturing (the amount of light they reflect). You usually meter incident light when you’re shooting in a studio, where you need high precision and you can be very close to the subject. On the other hand, reflected light is the light that the subject you’re going to photograph reflects. You can meter it with your camera’s light meter or a hand-held photometer placed next to the camera and facing the subject. Sometimes, it gives you an estimated result that may require your interpretation. Usually, when you expose your photos you meter the reflected light using your camera’s light meter. It’s also the only way to determine the exposure value when you can’t be close to the subject you’re about to photograph. In section 12 I’ll give you more details on the different methods that you can use to meter reflected light with your camera and when to use each one of these methods. Now that you have the basic notions of what light is and what its attributes are, let's move on. Let's see what exposure is, the journey that the light performs until reaching the sensor and what settings of your photo gear you can use to make the "correct" (or desired) exposure. It gets bumpy from here on out! Exposure is a quantity of light. It’s the amount of light that reaches a photosensitive material (the film or the sensor of your camera) to create an image. That, my friend, depends on the scene you have in front of you, and the result you want to get. It depends on whether you want to capture more or less detail in the dark (shadows) or bright tones (highlights). In the end, it depends on the story you want to tell. Therein lies the art of photography. You must exercise the right control over the light that reaches the sensor (or film) to get the image you want. In other words, your photo will vary depending on how much light you let into the sensor, that is, it will vary depending on how you expose the photo. Note: To avoid repeating the same thing over and over, let's assume you have a digital camera, so I’ll always talk about the sensor. If you use a film camera, the explanation would be the same, you just have to replace "sensor" with "film". The exposure (the quantity of light you’ve allowed the sensor to capture) determines how bright or dark your photo is. In other words, the more light reaches the sensor, the brighter your image is. And the other way round, the less light you let into the sensor, the darker your picture is. If more light gets to the sensor, you can capture more detail in the dark tones although you may lose detail in the bright ones, and vice versa. Your goal is to get the level of brightness/darkness you want in the photo. A level that allows you to show through the picture the scene as you see it or want to transmit it. To do that, you have to decide how much light you want to reach the sensor. To get it right and never forget it, you should first visualize the journey that the light makes to get to the sensor. This journey will lead you to the well-known exposure triangle that I’ll talk about in great length in section 5. The elements that are part of the exposure triangle (aperture, shutter speed and sensitivity) allow you to control the amount of light that reaches the sensor in your camera and, therefore, the exposure. Light goes through a series of elements along the journey starting on its origin and ending at the sensor of your camera. These elements are the lens and the shutter, and they allow you to control the amount of light reaching the sensor. First, light reaches the lens of your camera. As long as you don’t use one or more filters in front of the lens, of course. If you use filters, these are the first tools you can use to reduce the amount of light reaching the sensor. I'll talk about filters and how you can use them in section 22. For now, and to make things simpler, I'm going to assume you don’t use filters. Well, once inside the lens, the beam of light goes through the diaphragm. It allows more or less light depending on the aperture you have selected. So the aperture is the first element of the exposure triangle that you can use to adjust exposure. Of course, the larger the diaphragm, the higher quantity of light reaches the sensor and vice versa. If you want to allow less light through, use smaller apertures. In other words, close the diaphragm. Once it has gone through the diaphragm, the light beam reaches the shutter. Here comes the second element of the exposure triangle: the shutter speed. The shutter is a sort of curtain that allows light to reach the sensor (when it’s open) or prevents it (when closed). The period of time during which the shutter is open is called the shutter speed. It’s also known as exposure time. I’ll use both terms along the article. During the time the shutter is open, the beam of light hits the sensor of your camera. Therefore, when you set its value, you are affecting the exposure. The slower the shutter speed, the more light reaches the sensor and vice versa. The sensor is the place where the image is created inside the camera. It’s made of photosites or semiconductors sensitive to light. When the photons of the light beam impact on the photosites, they are captured and processed, generating the digital image of the scene that the camera sees. The sensor has the ability to digitally amplify the captured signal giving you the impression that it captures more light. Depending on the sensitivity (ISO) you select, the sensor amplifies the signal more or less. Mastering the sensitivity of the sensor is a key factor to expose your photos correctly. In a film camera the film has a certain sensitivity. In this case, when the light beam hits the film, the image is printed on it. Subsequently, the film is revealed by a series of chemical processes. Don’t worry if there are some concepts that you don’t understand. In section 5 I’ll explain you in a clear and simple way what the aperture (diaphragm), shutter speed (shutter) and ISO (sensitivity) are, what they are for and how you can control them. But for now, I want you learn that these parameters allow you to control the exposure and the creative effects that we'll see in section 4. Now, before going into the details, let's dig a little deeper into the concept of exposure triangle. When I explained to you the path that the light follows through the camera, I mentioned three key parameters: aperture, shutter speed and sensitivity (generally referred to as ISO). Together they form the well-known exposure triangle. Once you master the exposure triangle, you will dominate your camera (and even the world!). You might have forgotten it, but I also mentioned a fourth element that will help you control the light: the use of filters. But this is an additional element that not all photographers use, and if they do they use it only in certain situations. So I'll explain how and when to take advantage of the filters in section 22. Depending on what decisions you take when setting the aperture, the shutter speed and the ISO you’ll get one exposure or another. That is, one photograph or another. If you close the aperture, you reduce the size of the hole (the diaphragm) through which the light enters the lens, so the amount of light reaching the sensor is smaller. If you open the aperture, more light comes to the sensor. If the shutter speed is fast, the amount of light reaching the sensor is lower. If the shutter speed is slow, more light arrives to the sensor. At the same time, the higher the ISO value, the more sensitive the sensor is to light. That is, the sensor has more capacity to capture that light. And vice versa, the smaller the ISO, the less ability the sensor has to capture the light. All in all, aperture, shutter speed and ISO give you total control over the amount of light captured by the sensor. In other words, the total control over the exposure of your pictures. Determining the "right" exposure is totally subjective. For a certain photographer, a picture may have a correct exposure while another photographer may consider it badly exposed. It all depends on whether or not you get the effect you want to convey, or the result you have in mind. If you get it, then you have the photo you want and the exposure is perfect for you. “OK Toni, but there surely is a consensus on what could be considered to be a correct exposure”. The correct exposure is the one in which you don’t lose information in the shadows or the highlights. In other words, it’s the exposure that takes full advantage of the camera's sensor capacity to capture as much information as possible from the scene, capturing detail in both the shadows and the highlights. But getting that "right" exposure is not always possible. Unfortunately, the sensor in your camera is not capable of capturing the same brightness levels as your eyes does. And this is where the difficulty lies. Lose information in the shadows (there will be areas that will be black). Lose information in the highlights (you will have areas that will be white). Use other techniques so that the sensor is able to capture all the actual information, such as the use of filters (section 22), blending of several shots (section 23) or adding light to the scene (artificial light, the Moon...). In this type of situations, you have no choice but to go out on a limb and decide what you want to capture in the image. If you choose to lose information (detail) in the shadows or blacks, you will get an underexposed photo. On the other hand, if you decide to lose information in the highlights or whites, you will get an overexposed photo. Sometimes you will want to use one of these two effects in your favor. For example, to get what is called a low key or a high key. In the picture below I decided to shoot a high key, overexposing a large part of the scene, so that the musicians would blend perfectly with the environment. That’s how I managed to focus on the most important parts of the scene: the faces and the instruments. In the previous image I overexposed to focus on subjects, so in the next one (below) I decided to underexpose (shoot a low key) to highlight the beauty of the model’s eyes and face. Photography is imagination... And, sometimes, a scene that seems impossible to capture becomes a whole story. The spectacular silhouettes that you can capture by completely underexposing the foreground are a good example. I am in love with the Moon and its power to tell stories. You can do it too. Study this article and give it a try. But be cautious: photographing Moon silhouettes is incredibly addictive. Another example (and a huge challenge) is backlight. By mastering the exposure triangle you can capture beautiful backlights without losing too much information. What’s real is a “wrong” exposure! For me, a wrong exposure is the one you get when, in certain light conditions, you can’t shoot the picture with the exposure you want. That is, the final image is much darker or much brighter than your original idea. You don’t get the photo you want. Gear limitations (camera, lens, etc. ): When gear limitations don’t allow you to get the result you want. Lack of control of the exposure triangle: Aperture, shutter speed and ISO. Aperture, shutter speed and ISO allow you to get the correct exposure. But as you’ll see in section 4, what determines these settings is not the exposure but the idea of the photo you want to do (freeze motion, get a silky water effect, increase depth of field, capture stars as bright as possible, etc.). Once you have an idea, decide one or two settings (aperture, shutter speed, ISO) to get the effect you’re looking for, and then use the third (or the other two) to get the correct exposure. At this point, you should go deeper into learning about the exposure triangle and I should teach you how to expose. But photography isn’t only knowing how to expose. In fact, I dare say that exposing the photo is the last thing you do before actually taking the picture. The first thing is that you should know how to capture the photo that conveys the idea you want to express. What came first? The egg or the chicken? The exposure or the idea? You always have to choose the aperture, shutter speed and ISO depending on the photo you want to take, the effect you want to capture, the story you want to tell. Normally, you will determine one or two of the variables to get the picture you’re looking for and then decide the third (or the other two) to get the correct exposure. To sum up, depending on the aperture, shutter speed and ISO settings that you use, you’ll not only affect the exposure but you’ll also be able to express one idea or another, create one effect or another. The aperture allows you to control the depth of field: the part of the scene that appears sharp on the image. On the one hand, if you intend to show the spectator what’s happening in a larger part of the scene (increase the depth of field), you can do this by closing the diaphragm (reducing the aperture to f/8, f/11, f/16). In section 5 I’ll explain in detail what these f numbers are. To maximize depth of field if you’re using long focal lengths (70-500mm), use small apertures (f/8, f/11, f/16), and focus on a point located in the lower third of the scene. If you’re using short focal lengths (14-35mm), you can maximize depth of field without using small apertures. In this case, just focus at the hyperfocal distance. On the other hand, if you open the diaphragm (increasing the aperture to f/1.4, f/2.8, f/4), the depth of field decreases. It helps you to direct the attention of the spectator to a specific point or area of the scene. If you want the Sun, Moon or any other light spot (street lamp, lighthouse, etc.) to have the starburst effect in the photo, simply use small apertures (close the diaphragm to f/8, f/11, f/16). In astrophotography, if you want to capture a huge number of stars, you must capture as much light as possible during the exposure. So use large apertures (f/2.8, f/4, depending on your lens). Depending on the shutter speed, you can freeze motion or show it. Use fast shutter speeds to freeze the movement of a vehicle, a person, an animal, etc. These are some examples of shutter speeds that you can use to freeze motion. Bird flying: 1/800s - 1/2000s. Person walking: 1/125s at least. Sports (football, etc. ): 1/500s - 1/2000s. Car at 50 km/h: 1/1000s - 1/2000s. Car racing: 1/1000s - 1/8000s. Runners or animals moving panning: 1/15s. 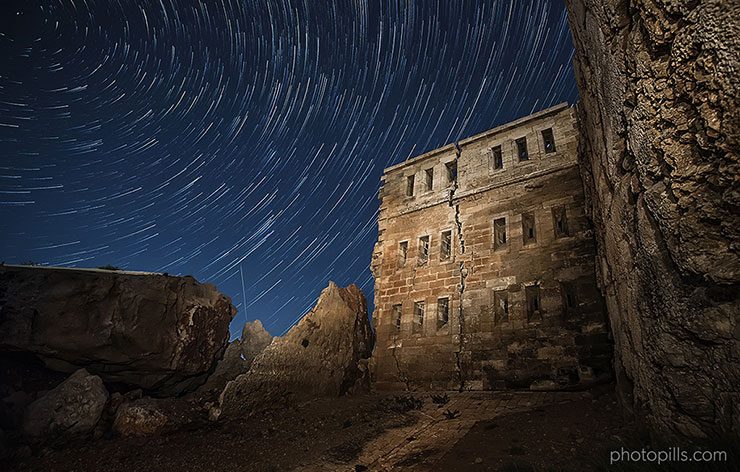 Avoid star trails: use the NPF rule or the 500 rule, or use the PhotoPills Spot Stars calculator. Avoid Moon trail: 1s maximum. Use slow shutter speeds to show to the spectator the motion in the scene (water, clouds, people, vehicles, Stars Trails, etc.). Here are some examples (you need a tripod). Show people moving, slow cars: 1/15s. Short star trails: 1min - 10min. Long star trails: 30min - 4h. Normally, once you have decided the aperture and shutter speed settings, you use the ISO to balance the exposure. When using high ISOs (1600, 3200, 6400), the sensor digitally amplifies the signal of the captured light. This allows you to take pictures that wouldn’t be possible otherwise, such as when shooting the Milky Way or a meteor shower. Of course, be careful with the noise levels produced by the sensor of your camera because the higher the ISO, the more noise the image has. This is because the sensor doesn’t capture more light (it doesn’t capture more information), but it amplifies the captured light signal to try to show more detail in the image. When stretching the information, the sensor isn’t able at a certain point to reproduce reality and produces the effect of noise (or grain). 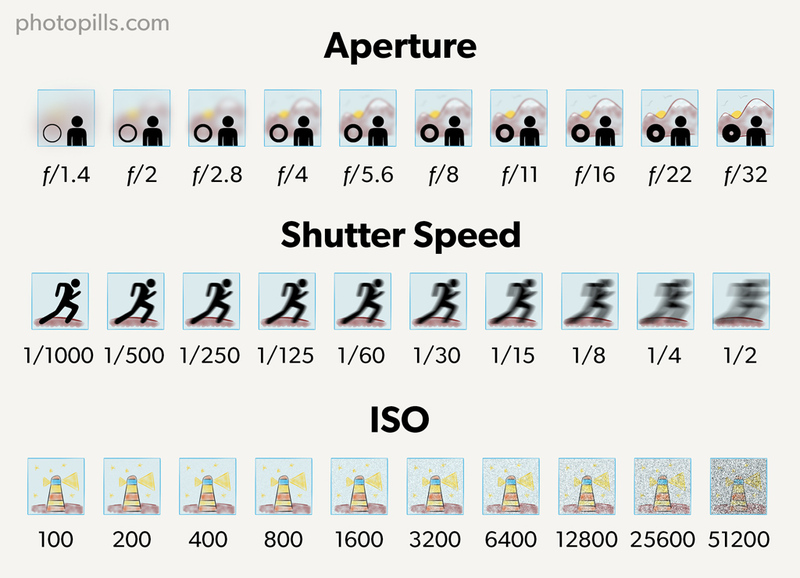 Since a picture is worth a thousand words, here’s a summary of the effects that you should take into account when deciding the aperture, shutter speed and ISO settings. Higher aperture (lower f number) → Lower depth of field. Lower aperture (greater f number) → Greater depth of field. Slower shutter speed (longer exposure time) → Show motion (blur, silk effect). Faster shutter speed (shorter exposure time) → Freeze motion (no movement). Greater ISO → More grain (more noise). Less ISO → Less grain (less noise). Let's have a look now at three practical examples of how to choose the aperture, shutter speed and ISO settings to get the photo you want with the right exposure. In section 24, you have 30 examples in which I explain you step by step how I managed to capture the photo I was looking for with the exposure I wanted. But for now I’d like to go over three of the examples so that you can see the logical reasoning behind my photographs. I hope that it will help you embrace the workflow I follow to set the exposure triangle parameters. Remember, the idea always goes before the exposure. To achieve this I chose a fixed focal lens (85mm) that is ideal for portraits both for its sharpness and its speed (in this case the aperture reaches f/1.8). However, I don’t need such a large aperture here. f/8 is more than enough since I’m shooting in a studio, with a totally controlled lighting environment. Also, because there’s a black background, I don’t need a large aperture to create a bokeh (or blur) in the background so it doesn’t distract the spectator. I stand about 3m from the model and focus on her right eye. With all this information and thanks to the PhotoPills calculator, I know that the depth of field is 0.59m. I’m using a fairly closed aperture (f/8) so this piece of information is not critical. But if I had used a much larger aperture, f/2.8 for example, I would have needed to know the depth of field accurately. That way I would have known where to position my subject according to which parts of her face or body I wanted sharp on the final shot. Once I know the depth of field and the model is at the right place, I meter the light using the spot metering mode of my camera. It’s my favorite metering mode because it’s the most precise one. I meter the lighter tone of the model's face so I don’t blow out the highlights (I'll explain more about this in section 17). Since I’ve selected the Manual exposure mode (M), and I’ve set my aperture, I have to decide the ISO and shutter speed settings. I set the ISO to the native ISO of my camera to reduce noise as much as possible: ISO 100. If you want to know more about noise, you have all the details in section 5. Finally, I set the last parameter, the shutter speed. In order to do this, I just have to look at the light meter and find the shutter speed value at which the light meter is zero-centered (section 11). In this case, 1/160s. Taking photos during a trip is the best way to visually document a story. You can actually add more or less artistic ingredients or use the image as a pure document. All you have to do is be a spectator of what’s happening around you. In this photo I just wanted to capture the joy of beginning an Icelandic adventure. Part of the PhotoPillers group was heading to the Reykjavik church. The only thing I did was to walk a few meters away to capture what was happening, to keep that moment’s atmosphere. In this type of photography, one of the most important decisions that you have to take is what focal length and what depth of field you want to use. These settings always depend on what you want to capture: a landscape, a portrait or simply capture the atmosphere of the place you’re visiting. Here the idea was to separate the group of photographers from the background. Considering the distance between the subjects and my camera, I chose a large aperture and a telephoto lens. I used the center-weighted metering mode to make sure I metered the correct exposure in the group. I chose a shutter speed fast enough to freeze any motion. In this case I set an automatic ISO and it was the camera who set it to 100. Landscape photography is one of my favorite types of photography, not to say my favorite. Here, the focal distance, the field of view and the framing are the prime factors. Depending on the frame I choose a specific focal length. I work my composition with the camera on the tripod. This composition takes me to set a certain focal distance. In this case I sought a balance between the clouds illuminated by the Sun setting, the arch and part of the coast, and the close-up detail of rocks and plants. Once this is done, I choose my aperture. In this previous photo, I closed the diaphragm to f/13 to maximize the shutter speed. Subsequently, I use PhotoPills to calculate the hyperfocal distance. When I focus I make sure that I focus at a distance a little bit longer (between 0.5m and 1m) and I put the focus in manual mode. As for ISO, I always try to use an ISO as low as possible to avoid noise in my image. Here, ISO 100. Now I have to meter the light of the scene. To do this, I use the spot metering mode, I meter the brightest area of the scene I want in detail and, taking into account the camera I use, I overexpose by 2 stops (+2EV). In section 17 I’ll explain in detail why I do this. However, I want to use a shutter speed a bit slower so that the silk effect in the water is perfectly noticeable. So I decide to use a neutral density filter (ND). Thanks to the PhotoPills exposure calculator, I find out that I need a 6-stop filter (ND64) to get the correct exposure. Finally, I’m in front of a sunset. Since there is a difference of light between the sky and the foreground, I use a 2-stop reverse graduated filter (GND 0.6) to further darken the area of the horizon where the Sun is located. Once this is done, I shoot while enjoying the scenery and the spectacular sunset. In short, to take the photo you want, first establish the settings allowing you to get the desired effect (aperture and/or shutter speed), and then adjust the third (or the remaining two) to get the right exposure. Time to go deeper into the key to learn to expose: the exposure triangle and its three elements. We have seen in the previous two sections that you have three elements to adjust the exposure: aperture (using the diaphragm), shutter speed (thanks to the shutter) and sensor sensitivity (also called ISO). 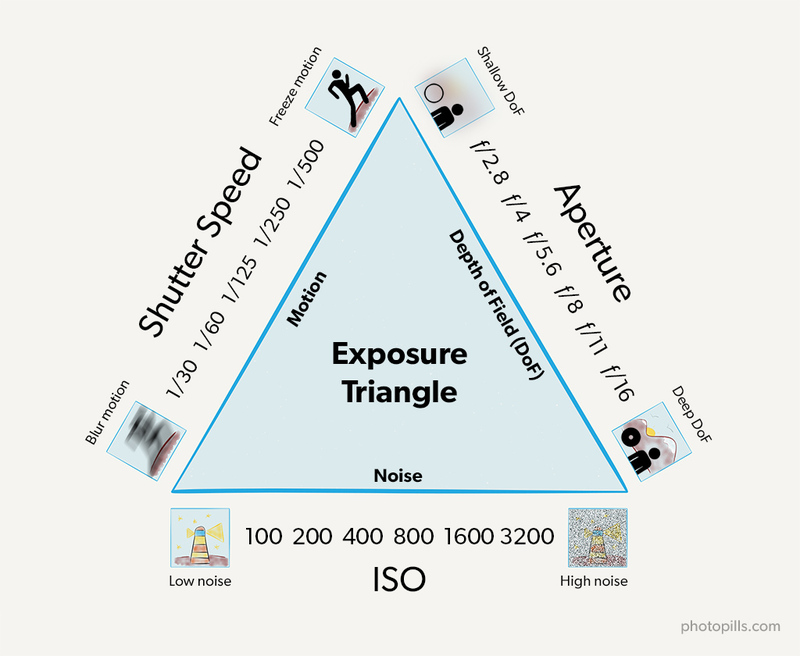 These three elements form the so-called exposure triangle. You increase the exposure by using large apertures, slow shutter speeds, and high ISOs. On the contrary, you reduce the exposure with small apertures, fast shutter speeds and low ISOs. Technically the ISO doesn’t affect the amount of light captured because the number of photons that are captured is defined by the aperture and the shutter speed. When you increase the sensitivity of the sensor (ISO), you’re actually amplifying the signal in order to get a brighter image. Therefore, for a given exposure, the aperture, shutter speed and ISO settings are closely related. In other words, they are linked one another. Imagine that you set an aperture, shutter speed and ISO setting that allows you to get the photograph you want correctly exposed. Awesome! You’ve captured the right amount of light! Now, if you modify one of the parameters that make up the triangle, you have to adjust at least one of the other two to keep the same exposure (capture the same amount of light). Check this out. If you change a parameter, you break the balance of the exposure triangle (by capturing a greater or smaller amount of light), so you have to modify at least one of the other two so that the triangle is balanced again (to capture the same light). For example, imagine that you have determined the aperture, shutter speed and ISO that allow you to freeze the movement of a bird in flight and get a well exposed photograph. You can reduce the shutter speed, to let light reach the sensor for a longer period of time. But if you do so, the bird will surely be blurred. You won’t freeze the movement. Or you can increase the ISO, to keep a fast shutter speed and thus to freeze the bird’s movements. In conclusion, depending on which parameter (aperture, shutter speed or ISO) you modify to adjust the exposure, you get one effect or another (depth of field, frozen motion, blurred subject, silk effect, etc.). Therefore, as we saw in section 4, the idea of the picture that you have in mind will tell you which parameter you should adjust. But let’s review one thing at a time. Let's have a closer look at each of the elements that are part of the exposure triangle. We have seen in section 3 that you can control the amount of light that reaches the sensor of your camera using the diaphragm of your lens. The diaphragm leaves a hole that allows light to go through it before reaching the sensor. Well, the size of that hole is what’s called aperture. But how do you know the hole size you’ve selected? The f number (f/2.8, f/4, f/5.6, etc.) indicates the size of the aperture you’ve selected. Well, the f number indicates the relationship between the diameter of the diaphragm (hole) and the focal length you’ve selected. More specifically, it’s the result of dividing the focal length (in mm) by the aperture diameter (in mm). So, for a given focal length, the larger the aperture, the smaller the f number, and vice versa. An aperture of f/2.8 is larger than one of f/4. Oh! Don’t you know what the focal length is? Let's make a quick aside. The focal length of a lens is the distance between the optical center of the lens (where the lens is situated) and the sensor (or focal plane, where the image is generated). Like the aperture and the shutter speed, the focal length is a parameter you can use to boost your creativity. It allows you to decide what part of the scene you want to include in the photo (field of view) and how big or small the subject appears in the photo. The smaller the focal length, the larger the field of view, and the greater the part of the scene included in the photograph. On the contrary, the greater the focal length, the smaller the field of view, and the smaller the area of the captured scene. So, depending on the photo you want to take, you choose a certain focal distance or another. 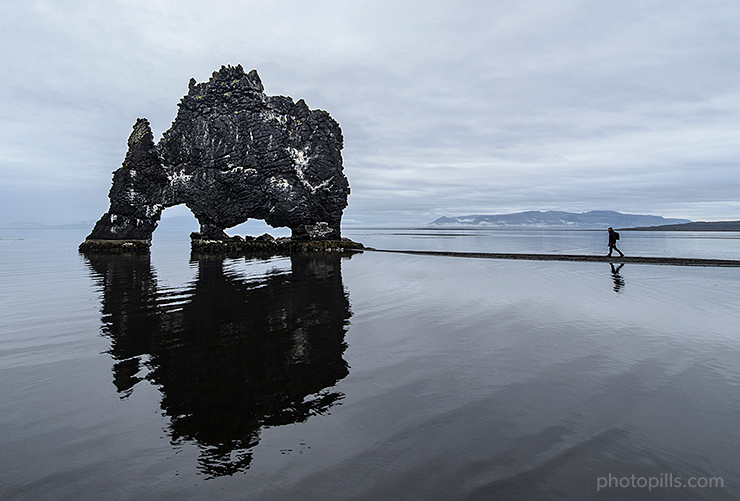 A short focal distance allows you to capture more landscape, as in this photo taken in Iceland with the dragon rock, Hvítserkur. And the longer the focal length, the smaller the field of vision, allowing you to focus on the subject. After this quick explanation, let's go back to the f number. As I said, if you divide the focal length of the lens by the diaphragm hole you get the f number of that particular aperture. If you open the diaphragm up to a 28mm diameter hole, the f number is 1.8 (50mm / 28mm = 1.8). In this case, the selected aperture is f/1.8. If you close the diaphragm, leaving a hole diameter of only 6.25mm, your f number is 8 (50mm / 6.25mm = 8) and the selected aperture is f/8. Relax! You don’t need to do any math. The smaller the value of the f number (f/1.8, f/2.8, f/4, etc.) the bigger the diaphragm is open and the more light you let pass. The larger the f number (f/8, f/11, f/16, etc.) the smaller the diaphragm and the less light you let pass. Thus, an f number of f/1.8 indicates a considerably larger diaphragm hole than that of an f/8, so it allows a lot more light to go through it. Remember that the greater the f number, the less light you let reach the sensor. We say it’s the standard scale because, as you close the diaphragm, each of these holes (f number) allows exactly half the light through than the previous f number. For example, an aperture of f/2 lets out twice as much light as an aperture of f/2.8, but half of an aperture of f/1.4. This is because the area of the diaphragm orifice through which the light travels is halved when you close the aperture from f/2 to f/2.8. And it’s doubled when you open the diaphragm from f/2 to f/1.4. In photography, this gap, this doubling (or halving) of the diaphragm orifice area is called a stop. Therefore, between two consecutive apertures of the standard scale there is a difference of one stop. Knowing the amount of light you reduce or increase when shifting from one aperture to another is key when exposing your photographs. This allows you to adjust the parameters according to the amount of light you want to increase or decrease. In section 6 I go into more detail when explaining the concept of stop. How do you select the aperture on your camera? Each camera is different. Have a look at your camera’s manual. In most cameras, you can change the f number by turning a control wheel. Because I’m a nostalgic, when I use manual lenses I change my settings in the menu so I can change the aperture using the diaphragm ring. What aperture do you need? As we’ve seen in section 4, you don’t always choose the aperture setting depending on how much light you want to capture to expose the photo. If you want more or less depth of field. Do you want to create a starburst effect on light sources? If you are looking to maximize the light the sensor has captured during a certain exposure time (shutter speed). For example, in night photography, the dim light will rarely allow you to use small apertures. You want to avoid diffraction. If you don’t want to lose sharpness in your photos, avoid closing the diaphragm as much as you’d like (f/22, f/32, etc.). The shutter is a sort of curtain that’s in your camera. It allows you to let light go through the sensor for a certain period of time. It opens when you press the shutter release button on the camera and it closes after a period of time you’ve previously selected. The time period during which the shutter is open is called the shutter speed, and it’s measured in seconds, minutes, or hours. Therefore, the longer you have the shutter open, the more light you allow to reach the sensor. On the contrary, the less time, the less light reaches the sensor. In this series 1/2 is half a second, 1/4 is a quarter of a second, and so on. As with the aperture, there is one stop between two consecutive values of the scale. For example, shooting at 1/4s you allow twice as much light as at 1/8s, but only half than at 1/2s. In other words, halving the shutter speed also doubles the amount of light that reaches the sensor, increasing the exposure (captured light) in one stop. How do you select the shutter speed on your camera? In most cameras, you can change the shutter speed by turning a control wheel. What shutter speed do you need? Depending on the idea of the picture you have, you need one shutter speed or another. Similarly to how the aperture helps you control depth of field, the shutter speed helps you control how the motion appears. You can freeze the subject or leave it blurry and fuzzy. For example, to freeze motion you only have to set a fast shutter speed. On the contrary, with a slow shooting speed, you blur elements that are moving in the scene. Or you can even get a very interesting silk effect in the water (a river, a waterfall or the sea). All in all, you always have to keep in mind the photo you want to produce, taking into account the message you want to convey and the exposure you need for it. In section 4 you’ll find some reference values of shutter speeds that you can use depending on the effect you’re looking for. The third element that helps you control exposure is the sensor and its sensitivity to light, generally known as ISO. Actually, the ISO sensitivity measures the sensor reaction to a certain level of light in the scene. When you use high ISOs on your camera, the sensor digitally amplifies the signal from the captured light. It doesn’t capture more light (more information) but it amplifies the signal, producing a brighter image. This gives you the impression that the exposure has increased. And vice versa, by using low ISOs, the sensor amplifies the captured signal to a lesser extent and the resulting image is darker. This gives you the impression that the exposure has been reduced. So, and it’s worth repeating it, technically the ISO doesn’t affect the amount of light captured, because the number of captured photons is defined by the aperture and the shutter speed. When you use a higher ISO, the camera amplifies the sensor signal so it can produce a brighter image. However, although ISO technically does not affect the exposure, I like to consider ISO as one of the exposure triangle variables that you should take it into account when exposing your photographs. Depending on the sensor sensitivity you set, you can play with different aperture and shutter speed settings. Sensitivity doesn’t have a unit of measure. And as with aperture and shutter speed, between two consecutive values of the ISO standard scale there is one stop, doubling or halving the light captured. As the ISO doubles its value, so does the amount of light that the sensor picks up. So an ISO of 400 is twice as sensitive as an ISO of 200, and the sensor captures twice as much light. The base or nominal sensor sensitivity is usually ISO 100 or 200, depending on the brand and model of the camera. Any ISO higher or lower than this base value is an amplification or attenuation of the signal that the sensor photosites receive. This signal amplification is done digitally, always causing a loss of quality of the final image. It's as if you force the sensor to capture more light. Or less, if you can set it below the base ISO. Some cameras, generally high-end ones, allow you to set ISOs of 64 or 50, for example. That's why I recommend, whenever possible, that you select the native ISO base of your camera (the lowest) or an ISO that is closest to it. Obviously, there are situations in which you can only take the picture by increasing the ISO a lot (800, 1600, 3200 or more), such as when photographing the Milky Way or Star Trails. In these cases, you’ll use the highest ISO you can. That is, the one with which your camera doesn’t produce too much noise. As you’ve read in the sections on the other two elements of the exposure triangle (aperture and shutter speed), you always have to pay the price when you want your camera sensor to capture more light. If you select a large aperture, you have a shallow depth of field. If you use a slow shutter speed, it’s harder to get the moving elements of the photo in focus (frozen). And now, if you increase the ISO your images begin to have grain or noise, as it is usually called. Noise is some sort of grain that appears in the photograph. It’s really ugly and it can ruin your photo. The higher the ISO you use, the greater the amount of noise that appears in the image. Actually, you can barely see noise with low ISO values (between 100 and 400). Even zooming in the image a lot on a computer, you’ll have a hard time seeing noise. But from ISO 400 on, noise begins to become more and more visible. Although the ISO value scale is standardized, the amount of noise corresponding to each of those values is not. This means that the amount of noise depends on the quality of the sensor your camera has. In fact, one of the first things you need to figure out is what is the maximum ISO that you can use on your camera while maintaining a reasonable noise level. How can you fight against noise? Don’t stare at me! Photography is not an exact science. If you’re shooting outdoors, on a clear sunny day, you can use a low ISO so your photos will be sharp and will have no noise. However, a low light situation like a forest on a cloudy day forces you to increase the ISO value. So, noise will be higher. In this case, you can use a tripod. So, even if you are forced to use a slow shutter speed, you can keep the ISO as low as possible. But be careful, your subject must be perfectly still or it will be blurry in the image. How do you select the ISO in your camera? Manual mode: use the camera controls to select the ISO value you want. Automatic mode (Auto ISO): The camera selects the ISO value for you depending on the aperture and shutter speed settings. Automatic mode with bracketing values: The camera selects the ISO value from a range of values that you set. For example, you can let the camera choose the ISO between the native ISO (100 or 200) and the highest ISO to avoid having too much noise in the photo (800, 1600, 3200, etc.). What ISO do you need? In many cases, ISO allows you to use the right aperture or shutter speed that allows you to take the picture you have in mind, either to get a certain depth of field, or to freeze or blur the movement. If you use a low ISO, you can use larger apertures to get a shallower depth of field in a portrait, shoot with slower shutter speeds to blur motion or, in night photography, to get Star Trails. In most cases you should use a low ISO, mainly to avoid having grain or noise in the image. For example, imagine you want to capture a landscape picture before dawn. You are in a low light situation, so you could decide to increase the ISO to compensate for that lack of light. The problem is that if your scene has dark areas (rocks, cliffs, caves or any other element of the landscape that light hasn’t illuminated), increasing the ISO results in an noise bump in those areas. Therefore, to capture more light in this particular case and, considering that part of the elements of your composition don’t move at all, you get a better result if you take a longer exposure. In addition to this, if there is water, clouds or other natural elements that are moving in your composition, you get a beautiful silky effect. On the contrary, a high ISO allows you to shoot using a faster shutter speed if you happen to be indoors without using flash or take a night shot where you want the stars to be big bright spots (no trails). One of the obvious situations in which it’s essential to use a high ISO is night photography. Imagine that you want to capture a landscape scene that shows an outstanding rock formation in the foreground, and in the composition you also want to include the Milky Way. Take the picture using the largest aperture (smallest f number) of your lens. By doing this you allow the sensor to capture more light. In addition to this, you can’t use a very slow shutter speed because the stars won’t appear as big bright spots. You’ll end up with Star Trails. The Earth does not stop rotating because you’re taking a picture! You can calculate the maximum exposure time to avoid Star Trails using the NPF rule or the classic 500 rule. Due to the light conditions and the type of photo, you have no options when deciding your aperture and shutter speed settings. So, what parameter do you have to nail the exposure? And in this particular case, you have no choice but to increase the ISO (1600, 3200, 6400, etc.) so that your exposure is correct. Making a good use of automatic ISO depends a lot on your camera. If you have a low-end camera (these are usually low-budget cameras aimed at beginners), my recommendation is that you shouldn’t use the automatic ISO function. This type of cameras usually begin to show noise problems at relatively low ISOs, starting at 800. Therefore, it’s best to keep the ISO as low as possible and determine the most suitable exposure for your photo by playing around with the aperture and shutter speed. However, if you have a mid-range or high-end camera, the automatic ISO function is a good option as long as you set an ISO range according to your camera’s limitations. Let's assume that from ISO 1600 on your camera generates a lot of noise and the grain is clearly visible in the photo. In that case, select an automatic ISO range between 100 and 1600. This way, you have more room to play with the aperture and shutter speed when deciding the exposure you want. By letting the camera always adjusting the ISO between 100 and 1600, you keep the noise under control. Is the triangle exposure concept still not clear in your mind? That’s an easy problem to solve. The analogy of the bucket and the faucet is perfect to explain how aperture, shutter speed and ISO affect the exposure. Imagine you want to fill a bucket to the brim with a faucet. How much open or closed is the faucet. How long you let the water run. And the size of the bucket. You can vary each of these settings separately to get different combinations that will result in a full bucket. Water would be the light and, while we are at it, the water pressure would be its intensity. How much open or closed is the faucet would be the aperture of the diaphragm. How long you let the water run would be the shutter speed. The bucket size would be the equivalent to sensitivity. A small bucket equals a high ISO. Let's say a correct exposure would be to have a brimful bucket. If you don’t control any of the parameters properly, the bucket may overflow. You would have an overexposed photo: certain parts of the photo come out white (or blown out). There is too much light! On the contrary, if the bucket is too empty you are underexposing the image: certain areas of the image come out black (without any detail). You don’t have enough light! The comparison of ISO to the bucket size is also interesting. A high ISO equals a small bucket. The smaller the bucket the less water you need to fill it. Similarly, the higher the ISO, the less light you need to expose the photo correctly. That means that the image will be well exposed but with less light, so noise appears in the image since the camera has actually captured less information (the water has less water). To conclude, in order to get a correct exposure (a brimful bucket) you need to use a suitable aperture, shutter speed and ISO. While explaining the aperture, shutter speed and ISO, I’ve mentioned the word “stop” several times. Well, the stop is a basic and essential concept that you need to understand to know how to expose. Let’s examine in depth its meaning and how to use it. Modifying the exposure one stop means to double (or halve) the amount of light captured by the sensor when you take a photo. It’s also the difference in the exposure of an image when you capture double or half the light. Maybe if I explain it to you otherwise, you'll understand better. Imagine that you have an aperture, shutter speed and ISO setting that gives you a certain exposure. If you change one of these three parameters to double the light, you’ve increased the exposure one stop. If instead of doubling the light, you halve it, you’ve decreased the exposure one stop. What are stops used for? A stop helps you to quickly expose your photos. It’s a measure that you can use as a reference as you change the exposure until you get the exposure that you consider correct. In photography, you must control completely the amount of light that the sensor captures and, at the same time, you must be able to associate that amount of captured light with the way the photograph you just took looks (its exposure). That's why it's critical that you know how the amount of light captured by the sensor varies when you change the aperture, shutter speed, and ISO settings. That way, you'll know how the photo will change at all times. Look at the three photos below and how the exposure changes when you increase or decrease by one stop the light that the sensor captures. In short, when you’re exposing a photo, knowing the stops between one exposure and another will make your work much easier. If the picture is underexposed (you haven’t captured enough light), you can increase the exposure by one stop (by doubling the amount of light when opening the aperture, using a slower shutter speed or increasing the ISO) and check how the image looks. And if you need more light, you can go up another stop, doubling again the amount of light captured. On the other hand, if the photo is overexposed (you have captured too much light), you can reduce the exposure by one stop at a time to expose the photo correctly. Well, light has different scales. The stop scale (whether it’s the aperture, the shutter speed or the sensitivity one) can be divided into half stops or in thirds of stop as well. Most cameras allow you to work with a scale of thirds of stop. This scale is the most common one among photographers. The great advantage of this scale is that it gives you much more control as you are able to increase (or decrease) the light captured more accurately. Let's see how the stop scales are in each of the exposure triangle variables. If you want to use the diaphragm to increase the exposure by one stop, choose an aperture that lets you double the light compared to the one you have previously set. So if you have set an f/8 aperture, open the diaphragm to an aperture of f/5.6 to double the light (increase the captured light by one stop). On the contrary, if you have selected an aperture of f/8 and you want to decrease the exposure in one stop, set the aperture to f/11. What if you want to change the exposure in less than one stop? As I told you before, if you want to make precise adjustments, the scale of stops can be divided into half stops or into thirds of stop. The latter is available in almost all cameras and it’s the most common one among photographers. In this case, each f number lets one third less of light go through the diaphragm than the previous f number. For example, f/2 allows a third less of light than f/1.8, but a third more than f/2.2. The shutter speed follows the same pattern as the aperture. And luckily for you, it's even easier to use. If you have set a shutter speed of 1/15s and you want to allow one more step of light (capture twice as much light), select a speed of 1/8s (twice as long). On the contrary, to halve the captured light (reduce the exposure in one stop), select 1/30s, which is exactly half as long as 1/15s. Each of these shutter speeds allows one third of light less in the sensor than the previous one, but one third more than the next. If you select an ISO of 400, one less stop is an ISO of 200 (half the light). Instead, an ISO of 800 is one more stop (twice the light). Now that you understand perfectly the concepts of stop and exposure triangle, you can start playing with them. Let's see how you can capture the exposure with different aperture, shutter speed and ISO settings. To do this, you need to use the reciprocity law. The reciprocity law… What a name! Don’t you think? Take it easy, there’s nothing to be afraid of. With such a name it looks like something awfully complicated, but it’s not. You should know by now that the exposure is determined by the amount of light (controlled by the aperture) that reaches the camera sensor (configured to a certain ISO) for a certain time (shutter speed). And, as we saw in section 4, depending on the aperture, shutter speed and ISO settings you will capture different effects (more or less depth of field, frozen motion or not, more or less noise, etc.). Now it's time to learn how you can get the same exposure (capture the same light) with different combinations of aperture, shutter speed and ISO settings. This allows you to change the aperture, shutter speed and ISO settings to get the effect in the photo you’re looking for while maintaining the correct exposure. To achieve this, use the reciprocity law. Imagine that you have an aperture, shutter speed and ISO settings that gives you the correct exposure. Now, if you increase the aperture by one stop (to allow twice as much light) and you also decrease by one stop the shutter speed (so that half the light enters), you get the same exposure than with your initial settings. Therefore, you capture the same amount of light. Once you get a correct exposure, the reciprocity law allows you to modify the aperture, shutter speed and/or ISO as you want to get the effect you’re looking for while keeping the same exposure. That is, capturing the same amount of light. Get the effect you’re looking for? What effect? As we saw in section 4, you may want to change the depth of field or freeze the motion (or not)... And to get that effect in the photo, you have to change the aperture, the shutter speed or even the ISO. Therefore, to maintain the exposure, depending on the parameter you change, you must apply the reciprocity law to adjust the other two. In conclusion, the reciprocity law allows you to modify the aperture, shutter speed and/or ISO to get the photo you are looking for while keeping the same exposure. Now, you decide that you want to decrease the depth of field to separate the subject from the background. And to get this you open three stops the aperture (f/8 → f/2.8). Since you’re opening the aperture three stops, the sensor receives three times twice as much light, overexposing the photo. Well, the reciprocity law says that if you want to capture the same light (same exposure) you must modify the shutter speed and/or the ISO. Imagine that you are in low light conditions and you want to use a high ISO (800 in this case). All you have to do is reduce by three stops the shutter speed (1/250s → 1/2000s), to capture less light, and thus compensate the exposure. In this example you’ve used full stops, but the law is the same if you use thirds of stop. The important thing is to maintain the balance between the exposure triangle elements in order to capture the same light. So you get the same exposure than the one of previous combinations if you use an ISO of 800, an f/7.1 aperture and a 1/320s shutter speed. Because an aperture of f/7.1 is one-third greater than f/8 (its captures one-third more light). And, at the same time, you've reduced the shutter speed by a third of the time, from 1/250s to 1/320s. So the amount of light you're going to capture will be the same. And what about the ISO? Why have you kept this parameter constant so far? As you may have already guessed, you can also use the ISO as a tool to keep the same exposure. For example, if you double the ISO (capturing twice as much light), you can compensate for it by using an aperture one stop narrower or exposing for half the time. As you can see, there are many combinations that produce the same exposure, and all of them are equivalent. They are combinations of aperture, shutter speed and ISO equivalent in terms of light, but not from the aesthetic point of view (of the effect or the type of photo). Yes, all these combinations will help you capture the same light. However, as we saw in section 4, depending on the settings, you change the depth of field, freeze any motion or not and there can be noise (or not). When opening the diaphragm (large apertures) you capture more light, and a shallower depth of field. And when you close the diaphragm (small apertures), you capture less light, but a greater depth of field. By using a slower shutter speed, you capture more light but you don’t freeze the movement (silky effect or blur). And by using a faster shutter speed, you capture less light and you can freeze the movement. By increasing the ISO, you capture more light but also generate more noise (grain) in the image. And by reducing the ISO, you reduce the noise and capture less light. When you change the aperture, shutter speed and/or ISO you have to check the exposure, and you also have to keep in mind how the photo will change. Two different aperture, shutter speed and ISO combinations can give you the same exposure, but can produce different effects in the photo. Therefore, you’ll take two different photos. Let's see some practical situations in which you first find out the aperture, shutter speed and ISO combination that gives you a correct exposure. Then you change their settings depending on the photo you are looking for. I’ll use the manual exposure mode in all the examples to have a complete control over the exposure. I’ll also use the PhotoPills exposure calculator so I don’t have to do the calculations of the reciprocity law in my head. If you want to take a single long exposure Star Trails image (one unique photo), you’ll have to use slow shutter speeds (10min or more) to get longer and aesthetic trails. But when you are in your shooting position, taking test pictures until you find the correct exposure, the last thing you want is waiting for so long between one shot and the next. Can you imagine having to wait for 10min, 20min or even hours to find out if the photo is correctly exposed? It would be crazy! You need a much faster method to find the exposure you want. The solution is the reciprocity law. The idea is to take test photos until you reach the correct exposure. To do this use the maximum aperture that your lens allows you, a very fast shutter speed and a high ISO. Once you find the combination of aperture, shutter speed and ISO that gives you the correct exposure, apply the reciprocity law to use a shutter speed as slow as possible to get the length of star trails you want. In order to do this, you’ll have to reduce the ISO or even close the aperture a little bit. As you know that high ISOs produce noise (grain) in the photo, being able to use lower ISOs (as close as possible to your camera’s nominal one) will help you reduce this horrible effect. Let's see how you would do it. Imagine that you’ve taken a test photo of 20s at f/2.8 and ISO 3200, and the photo is underexposed. Take a second test photo by decreasing the shutter speed to 30s for example. Conversely, if the picture is overexposed, use a faster shutter speed (shorter exposure time). The issue is to modify the shutter speed until the photo is well exposed. Imagine that at 30s, f/2.8 and ISO 3200 the test photo is perfectly exposed. Although it depends on your camera, when shooting at 3200 ISO your image may have some noise. But it doesn’t matter because you’re not going to take your final photo at ISO 3200. Remember that you’re just taking a test photo. You’ll take the final shot using the nominal ISO of your camera, ISO 100 for example. And that will reduce the noise to the maximum extent. So if you want to use an ISO of 100 and an aperture of f/2.8... What shutter speed allows you to keep your photograph properly exposed? If you would like to continue slowing the shutter speed, you could close the aperture. For example, closing the aperture one stop (from f/2.8 to f/4) you can use a shutter speed of 32min (the double). When you're shooting in the field, doing the math is a pain in the back. Besides, you should avoid wrong calculations. It would be a pity to realize after waiting for 30min that you haven’t applied the reciprocity law correctly! Since it’s the easiest way and it prevents mistakes, I always use the PhotoPills exposure calculator. In this case, first set the shutter speed as the parameter you want to calculate. Then, it’s very simple: enter the aperture, shutter speed and ISO values of the test photo correctly exposed. Once this is done, enter the aperture (f/2.8 or f/4) and ISO (100) values that you want to use in the final photo (they are the equivalent settings). The calculator gives you the new shutter speed you have to use: 16min at f/2.8 or 32min at f/4. PhotoPills Exposure Calculator - Aperture f/2.8, ISO 100 and shutter speed calculation 16min. PhotoPills Exposure Calculator - Aperture f/4, ISO 100 and recalculation of shutter speed 32min. Let me introduce you Aina, my youngest daughter. The truth is that she loves modeling, contrary to her mother who hates it (I hope Assumpta, my wife, doesn’t read this). To shoot the first photo, I use an aperture of f/5.6 to get more depth of field. Why do I want more depth of field? To show some details of the rocks at the back. I set the ISO to 160 and the shutter speed to 1/30s so the photo is well exposed. I check this by making sure the light meter is centered at zero. I don’t quite like the resulting photo, so I decide to open the diaphragm 4 stops to f/1.4 to reduce the depth of field. So, keeping the ISO at 160, the reciprocity law tells me that I should use a shutter speed of 1/500s. That is, reduce the light by 4 stops. As you see in the final result (the photo above), the rocks behind Aina come out very blurred thanks to a shallow depth of field. At the same time, the exposure is correct because it’s neither too dark (underexposed) nor too bright (overexposed). Na Joanassa is a long and relatively low rock formation. It’s located near the coast, on the island of Menorca, Spain. It’s one of the ensembles that have always caught my attention in Menorca and photographing it has been fascinating. That day the intensity of the wind and the rain are constantly changing. Both become strong at times and I’m having a hard time keeping the camera on the tripod. A small rock that resembles a cave allows me to hide the backpack with all my equipment while I wait for the rain to let up. However, during those moments the wind and the waves create an atmosphere that is worth photographing. So I decide to stay there despite the weather. Actually, what I want is an image that conveys what’s happening right at that moment. I seek to capture a dramatic scene with the sky and the water breaking on the rocks. I want to capture the movement of the clouds in the sky and the waves whipping the stone. The first thing I do is to work on the composition and I choose the lens that allows me to capture the rock formation completely, part of the water in the lower strip of the frame and a lot of sky so that it shows tons of clouds. I take the Nikon 14-24mm f/2.8 from the backpack and attach it to the camera. Now I have to determine the focal length. The rocks are very close to the coast, so I’m forced to open a very wide angle of vision. I select 14mm, I slightly twist the wheel, and when I reach 15mm I like how the framing looks. Here comes the key moment: the exposure settings! I know that I want to convey motion in the water and clouds. In order to do this, I need a slow shutter speed that allows me to get that silk effect in the clouds and in the water. In this case, I determine the parameters in order to extend the exposure. First, I set the aperture to f/11 to have a large depth of field and also to use a slow shutter speed. Then, I select a low ISO to avoid noise: ISO 100. Finally, I need to decide the shutter speed. But how much time do I need? I generally shoot in Manual mode (M). In section 13 I’ll explain you the different modes of exposure (or shooting). But for now, stick with the idea that I determine the shutter speed by making sure the light meter is centered at zero so the photo is correctly exposed. I take the photo. The shutter speed that gives me a correct exposure is 1.3s. But I realize that the image doesn’t reflect the motion with the intensity that I would like. I need an even slower shutter speed. How do I get it? Using a 6-stop neutral density filter (ND). This type of filter allows to decrease the shutter speed since it reduces the amount of light that enters through the lens. I’ll explain it in more detail in section 22. However, when I put this element in front of the camera, my exposure settings are no longer useful. I take a picture and, as expected, it’s too dark (underexposed). So we’re back to the initial question: what shutter speed do I need to get a correctly exposed picture with the filter I'm using? I use the PhotoPills exposure calculator to calculate the equivalent shutter speed: 1min 30s. PhotoPills Exposure Calculator - Set the shot settings (f11, ISO 100, 6-stop ND filter) to calculate the shutter speed (1min 30s) that gives you the correct exposure and the effect you want. Finally, I set the white balance (I briefly mentioned it in section 2). It’s another variable that I like to control manually. In this case, when using a Haida ND filter, I know from my experience that it has a cool cast (it slightly dyes the image with a blueish tone). So I decide to increase the color temperature to 9000K to avoid too much blue color cast in the image. As you can see, the image is now very cold conveying an even more gloomy atmosphere. From the reciprocity law you have deduced that there are many combinations of aperture, shutter speed and ISO that allow you to obtain the same exposure. In other words, you can capture the same amount of light with different settings. This brings me to the concept of exposure value (EV). What’s the exposure value (EV)? The exposure value (EV) is simply a number representing all combinations of aperture, shutter speed and ISO that produce the same exposure (capture the same amount of light). In other words, all configurations that capture the same amount of light (produce the same exposure) have the same EV number. For example, EV0 is the amount of light that captures the sensor with an aperture of f/1 for 1s and with an ISO of 100 (and all equivalent configurations). The EV increases by one unit for each stop that you increase the exposure. And, conversely, the EV decreases by one unit for each stop that you decrease the exposure. How do you calculate the EV? N is the f number, t is the shutter speed in seconds, and ISO is the ISO level you are using. For example, what EV do you get with a combination of f/8, 1/4s and ISO 100? Thus, we can say that all configurations equivalent to f/8, 1/4s and ISO 100 correspond to an EV of +8. There is a much easier way to calculate the EV from the aperture, shutter speed and ISO values: using the PhotoPills exposure calculator. Enter the values on the first row of the calculator (test settings) and you will get the EV in the results table. You can use the second row (equivalent settings) to apply the reciprocity law, whether you are using filters or not (although I'll tell you more about them later on, in section 22). PhotoPills Menu - Different photographic tools among which is the exposure calculator. PhotoPills Exposure calculator after entering values for aperture, shutter speed and ISO to calculate the EV (+8EV). What is the EV for? The EV helps you reduce the "try and fail" when exposing. Use it as an indicator to quickly find the aperture, shutter speed and ISO settings. There are tables, such as the one included with PhotoPills in your exposure calculator, that suggest the exposure value (EV) at ISO 100 for different lighting conditions. That said, take these values as orders of magnitude or starting points, not as absolute truths. For example, according to the table of the first screenshot below, to correctly display a "Rainbow with Clear sky background" you should use a combination of the exposure triangle that gives you an EV of +15 at ISO 100. PhotoPills Exposure Calculator - EV Values Table at ISO 100 and daylight situation. PhotoPills Exposure Calculator - Table of EV values at ISO 100 and outdoor artificial light scene. Therefore, you can begin to expose looking for the combination of aperture and shutter speed at ISO 100 gives you an EV of +15. If you click on the "Rainbows" row, PhotoPills gives you a valid combination: f/8, 1/500s and ISO 100. If you’re not happy with these values, you can calculate other equivalents. Select the setting you want to calculate, in this case "shutter speed", and enter the values you want to use in the "Equivalent settings" row. In your case f/10 and ISO 100. The new speed is 1/320s. PhotoPills Exposure Calculator - Rainbow exposure settings (f/8.0, 1/500s, ISO 100). PhotoPills Exposure Calculator - Equivalent settings (f/10, 1/320s, ISO 100). This is your starting point. Now take a test photo and adjust the parameters accordingly. First, make sure the photo has the exposure you want. Otherwise, adjust some of the settings until the photo is well exposed. Once you’ve got the exposure you are looking for, if you don’t like the resulting photo or you haven’t achieved the effect you want, adjust the aperture and/or shutter speed and/or ISO values by applying the reciprocity law. You can do the calculations on your own (section 7) or use the PhotoPills exposure calculator again. All DSLR and mirrorless cameras have a tool to compensate the exposure (±EV). This setting allows you to increase or decrease the exposure calculated by the camera in a series of stops (or fractions of stop). For example, if you select +1/3EV, the camera will overexpose your photo in one third of a stop. When you use the automatic mode P.
When you use the semi-automatic modes of Aperture Priority (A or Av) or Shutter Speed Priority (S or Tv). When you use the Manual mode (M) and you have selected the automatic ISO (remember to set it within an interval so that it doesn’t go beyond the ISO from which your camera generates a lot of noise as I explained in section 5). However, if you shoot in fully Manual mode (M), this tool is useless because you control the exposure yourself. That is, you modify the exposure by manually adjusting the aperture, shutter speed and ISO settings. The light is distributed unevenly in the scene. Typically, there are areas where the light is more intense and looks brighter. On the other hand, there are areas where the light is less intense and looks darker. When you’re working on your picture’s exposition, it’s essential that you understand the different light intensities of the scene. When you face a scene, you should know if your camera is capable of capturing detail everywhere in the scene. That is, if it’s capable of capturing detail in both the darkest areas of the scene and the brightest ones. This brings me to the main concept so you understand how to expose: the dynamic range. The dynamic range is measured in stops or exposure values (EV) and it shows the difference in light intensity between the darkest shadows and the brightest highlights of the scene. In this section I'll explain you why you have to differentiate between the dynamic range of the scene you want to shoot and the dynamic range that your camera is capable of capturing. When the camera is not able to capture in a single exposure and with enough detail the darker and brighter areas, we say that the dynamic range of the scene you’re facing surpasses that of the camera. In section 22 and section 23 I’ll give you several solutions so you can expose for this type of high contrast scenes. But first, let's dig deeper into the concept of the scene’s dynamic range. The dynamic range of the scene is the brightness difference that you have in the scene you want to shoot. This range depends on how the light is distributed in the scene and it’s measured in stops or exposure values (EV). You probably understand it better with an example. Look at the picture below. Let's calculate the dynamic range of the scene. That is, the number of stops between the highlights and the shadows. If you meter with the camera the light of the brightest highlights, you get a combination of aperture, shutter speed and ISO to correctly expose for these highlights (with the light meter centered at zero). Thanks to these three values you can obtain an exposure value or EV. You’ll understand it perfectly when I’ll explain you the different metering (section 12) and exposure (section 13) modes that the camera has. For now I just want you to keep in mind that you have to select the Aperture Priority (A or Av), Shutter Speed Priority (S or Tv) or Manual (M) exposure mode. Either of them is useful. Once this is done, select the spot metering mode. This mode allows you to accurately meter the light wherever you want. In the photo bellow, to correctly expose for the highlights you need to shoot at f/8, 1/160s and ISO 400. In section 8 you learnt that any combination of the three parameters giving the same exposure can be represented as an exposure value or EV. In this particular case, the highlights have a value of +11 ⅓ EV. You can find out the EV thanks to the PhotoPills exposure calculator. Simply enter the values of the exposure triangle and the EV will be displayed in the lower results table. PhotoPills Exposure calculator - Enter the test settings (f/8.0, 1/160s, ISO 400) that expose the highlights correctly to calculate the EV (11 ⅓ EV). PhotoPills Exposure calculator - Enter the test settings (f/8.0, 3min 12s, ISO 400) that expose the shadows correctly to calculate the EV (-3 ⅔ EV). Repeat the same process for the shadows, and you'll get another combination of aperture, speed, and ISO. And therefore, another EV. According to the previous PhotoPills screenshot you get a -3 ⅔ EV. Once you have both exposure values, subtract the shadows from the highlights. Therefore, in this case the dynamic range of this scene is +15 EV. The dynamic range of the scene is +15 EV. What does it mean? To put it bluntly, that there’s a difference of 15 stops between the settings to correctly expose the shadows and the ones to correctly expose the highlights. And if you want to capture detail in both areas (shadows and highlights) you need a camera capable of successfully capturing these 15 stops. Since my camera has a dynamic range of about 10 stops or so, it won’t be able to capture the entire dynamic range of the scene, so I decided to shoot a silhouette. I was composing the scene in this cave when, suddenly, Joanma appeared in the frame. "Stand still!" I said. His silhouette gave me an opportunity to capture a different sunset photograph and use his silhouette to break the great negative space produced by the shadows. I didn’t have to change any settings since I was going to photograph the same composition but metering the highlights to boost the colors of the impending sunset. So, depending on the location and the time of day (or night) in which you are taking pictures, you’ll find different dynamic range scenes. And you have to learn to successfully expose them. Landscape scenes during daylight hours (around noon). Or when you include a source of light like the Sun in the frame. In this case you can shoot backlit silhouettes. However, other scenes have a narrower dynamic range, such as a landscape during the golden hour or the blue hour. These are two moments during which you can photograph, for example, the landscape and the Moon in a single exposure. And that’s possible because of the narrow dynamic range of the scene. It's time to combine the dynamic range of the scene with the dynamic range that your camera is capable of capturing. You need to understand both to expose. What’s the dynamic range of the camera? Do you remember when I explained to you that the sensor on your camera is much less accurate and efficient than your eyes? Unfortunately, the sensor of any digital camera is only capable of capturing a certain amount of dynamic range in a single exposure (single photo). Currently, that range is between 8 and 14-15 stops depending on the sensor. As long as the difference in intensity between the brightest highlights and the darkest shadows of the scene falls within the dynamic range of your camera, you’ll be able to capture all the detail of the scene in a single shot. You won’t have any overexposed or underexposed areas in the photo. What happens when the dynamic range of the scene exceeds that of the camera? If the dynamic range of the scene exceeds that of your camera, you will have to resort to multiple exposures or to use of filters. In section 22 and in section 23 we’ll see in detail how to expose when you face situations with a high dynamic range. Once again, let's look at an example. Imagine that you want to photograph a scene with an 8-stop dynamic range (or EV). If your camera has a dynamic range of 10 or more stops, you can capture the scene seamlessly in a single photo. But what if the dynamic range of the scene exceeds that of your camera? Overexposing certain areas, and lose information in the highlights. Underexposing other areas, and lose information in the shadows. Taking a bracketing or a multiple exposure. That is, take two or more photographs to cover the whole dynamic range of the scene and then blend them together in post- processing. Producing a bracketing directly on camera. The camera takes a number of pictures to cover the dynamic range of the scene and it blends them, displaying the final image. Using filters, although this is a more advanced level. We’ll look at the filters in detail in section 22. Another option is to look for the hours of day when the light is soft and with a low dynamic range. I’m referring to the golden hour or the blue hour, which are fantastic moments for any type of photography (landscape, Moon, urban, portrait, street ...). The last option is to use a camera capable of capturing a high dynamic range, which allows you to simultaneously record the detail in both very dark and very bright areas of the scene. I’m talking about high dynamic range cameras. How do you know if the dynamic range of the scene exceeds that of the camera? In Chapter 1 you learnt the basics of exposure ( what's exposure, exposure triangle, reciprocity law, exposure value, etc). In Chapter 2 you'll learn how to use the histogram, the light meter, your camera exposure and metering modes, the exposure compensation button and how to expose step by step among many other useful things.